Competition, action, sheer athleticism – it all culminates on the North Shore of Oahu for the most celebrated surfing series in the world, the Vans Triple Crown of Surfing. Known as the longest running and most prestigious surf event in history, the Vans Triple Crown of Surfing is comprised of three gems – the Hawaiian Pro, Vans World Cup of Surfing and Billabong Pipe Masters. This year the series again offers $1,175,000, including the $100,000 Pipe Invitational, and a $50,000 bonus for the Vans Triple Crown Series champion. In 2014, more than 30% of the total prize purse stayed in Hawai‘i with local surfers. Each location of the Vans Triple Crown is anchored in three distinct waves of varying degrees of intensity. Haleiwa, Sunset and Pipeline represent the diversification of surfing’s ‘playing field’; Be they long winding sandbar point breaks, shifting reef breaks and beach breaks, or more serious reef slabs that hit the same spot every time, the modern professional surfer must adapt and thrive, or disappear from the top brackets of the World Tour. of distinction, the Vans Triple Crown of Surfing returns this year with even more excitement, as waves and athletes collide for an anticipated season of big surf, thanks to an El Niño strong year. Showcasing the endurance and versatility of approximately 170 surfers, the world’s best flock to the North Shore in a larger-than-life fight for points, money and glory at the world’s most elite waves. Featuring the top 128 surfers in the world, the Hawaiian Pro takes place at a powerful beach break known as Haleiwa at Ali‘i Beach. Haleiwa town is considered the ‘gateway’ to the 7 Mile Miracle, so it’s only fitting that event No. 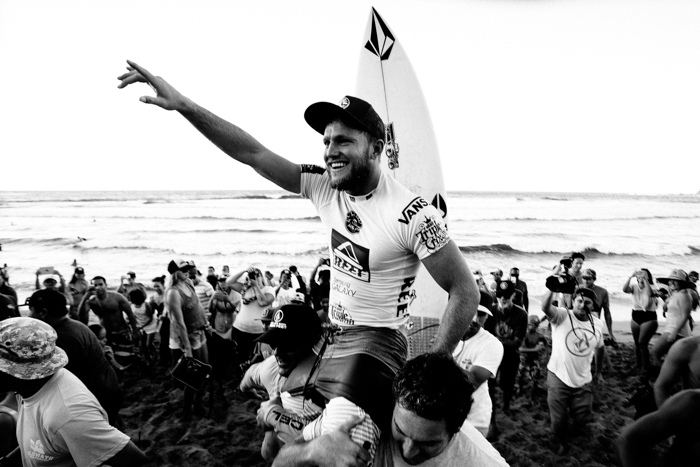 1 – the Hawaiian Pro – be the gateway to the Vans Triple Crown of Surfing. With a heavyweight QS 10,000 status, the first event of the VTCS is the second to last event of the WSL Championship Tour season and heavily impacts the ratings. An easy spectator experience, this event allows for front row seating on the sand as surfers tackle the tricky conditions that make this wave so noteworthy. Goofy foot surfers will have their work cut out for them, as the list of champions here definitely stacks in favor of the regular foots. Since 1985, only two goofy footers have been event winners – Barton Lynch (1988) and Conan Hayes (1999). Regular footers have dominated Haleiwa, especially Hawaiian powerhouse Sunny Garcia who takes top honors of winning five titles here! Flanked by the Haleiwa Harbor on one side and a grassy field on the other, it’s an amenable venue to kick off the Triple Crown of Surfing. • Haleiwa is a dominant right breaking wave with a left breaking wave on the smaller days. 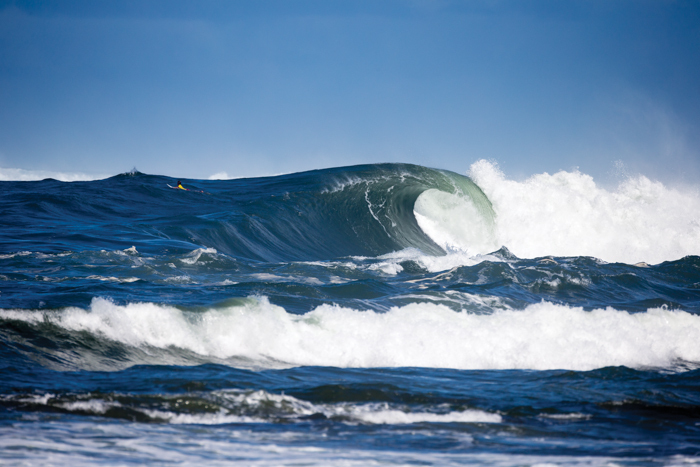 • The inside section of the right is nicknamed ‘The Toilet Bowl’, which drains over shallow reef, allowing for big finishing maneuvers and dramatic wipeouts. • Best on a hard west swell. • Under 4 feet, Haleiwa features a right and a left and is a fun hotdog of a wave in either direction. There’s even a separate little reef on the north side called Peaks that provides a feisty right-hander. • Over 4 feet, the outer sections of Haleiwa come to life and the wave can get critically steep and hollow on good west swells. • Facilities include public restrooms, showers, picnic tables and lifeguard patrol. • Beach bordering shrubs and trees provide small amounts of shade, while the monkeypod trees in the grassy park offer more shaded areas, however the best views of the surfing is right in the sand. • This venue is located off Haleiwa Road, through Ali‘i Beach Park, on the west end of the harbor, not to be confused with its more northern sister, Haleiwa Beach Park, which is located next to Pua‘ena Point on the north side of the harbor.